This article is a step by step break down on how to set up vehicles to a loaner vehicle. This will only be available for the system and not on your website. A loan vehicle would mean that the rack rate of a vehicle class is zero. Here, select “Yes” under the “Enable Loan Vehicle Rental” highlighted in orange in the picture below. Next, click on the blue “Save” button located at the bottom of the page highlighted in orange in the picture below. 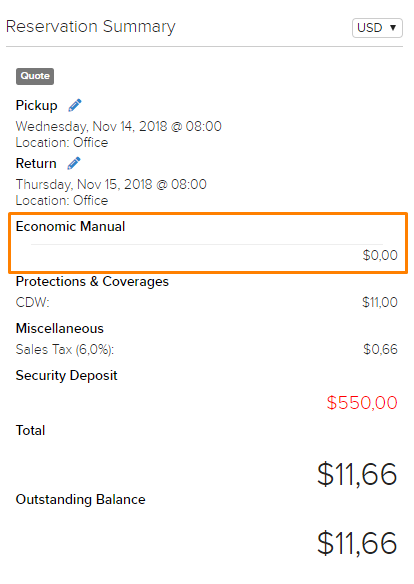 Now when you are doing a reservation, on Step 3, there will be a white button “Loan Vehicle” as shown in the picture below highlighted in orange. When you click on this button, you will see that the rack rate is now zero for the vehicle class that you have selected. An example is shown in the picture below. To turn the reservation back to a regular reservation, navigate back to Step 3. The white “Loan Vehicle” button is now a “Regular Reservation” button as shown in the picture below highlighted in orange. Clicking on that particular button will revert back the reservation to a regular one. To learn more about the reservation process, follow this link here.